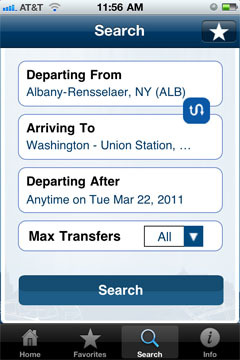 The Search screen is used to search for train schedules. Enter the departing and arriving train stations, the date/time, and the maximum number of transfers allowed. Enter information by tapping the input field. 1. "Departing From" Enter the station you plan to depart from. 2. "Arriving To" Enter the station you plan to arrive at. displayed. To switch between "Leave After" or "Arrive By" tap for the desired option. 4. "Max Transfers" Enter the maximum acceptable amount of transfers. 5. The Reverse icon is used to switch the Departing and Arriving Stations. After the search button is tap the Schedules Results screen will be displayed with train schedules that match the search criteria. To enter "Leaving After" or "Arriving By" tap the date/time field. If a train is not found for the day you specify the application will check for 3 additional days. If a train schedule is still not located the message “No Schedules Found” will be displayed. To switch between "Leave After" or "Arrive By" tap for the desired option. If you choose "Arrive By" the "Leaving After" Date field will be changed to "Arriving By"
To enter a station type in the desired station name and select the station. The Schedules Result screen displays the results from your search. 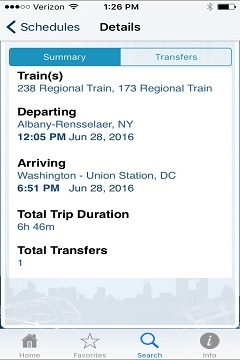 This includes the departure date, departure time, number of transfers, arrival time, and train name. If a train is not found for the day you specify the application will check for 3 additional days. If a train schedule is still not located the message “No Schedules Found” will be displayed. 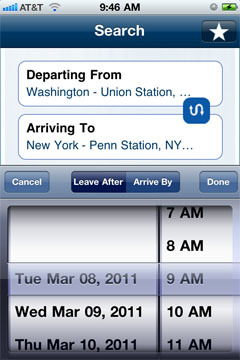 The Detail icon is used to transfer control to the Schedules Detail screen. The Favorites Icon is used to add a Station or Route to your Favorites. See the end of this page for information on adding a favorite station or route. The Schedules Detail Summary screen displays the detail schedule for the trip you selected. This includes the train(s) name, departing station/time/date, and the arriving station/time/date, the trip duration and total transfers. By default the "Summary" tab is displayed. Tap on the "Transfers" tab to display the transfer information. 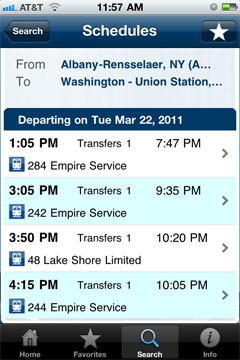 The Schedules Detail Transfers screen displays the train information for each leg of your trip and the time between transfers. For each transfer this includes departing station/date/time, train name, train travel time, arriving station/date/time, and transfer time between trains. Tap the "Summary" tab to return to the Schedule Detail Summary Screen. 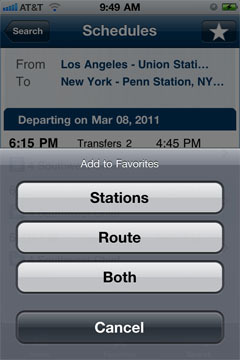 The Favorites Icon is used to add the Station or Route to your favorites. 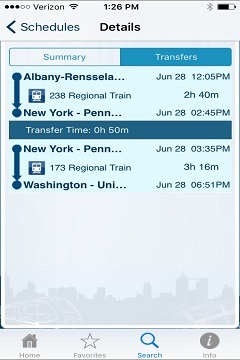 After the icon is tapped you will have the option of adding the stations, routes, or both to the favorites. 1. "Stations" tap button to add the Stations to your favorites. 2. 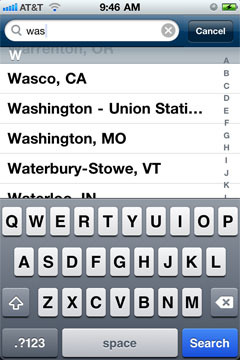 "Route" tap button to add the Route to your favorites. 3. "Both" tap button to add Stations and Route to your favorites. 4. "Cancel" tap button to remove options. See the favorites section for additional information.